In the main user administration screen double-click on the user that you want to give access to the other users archive. This opens up the ‘User Properties’ dialogue window. Here we have a user ‘Helen’ who needs to have access to another archive for a user called ‘Fred’ so we double click on Helen to edit her access rights.. The settings we’re interested in are in the ‘Privileges’ section at the bottom of the page. If we want Helen to access an archive for another user ‘Fred’ we can simply click on the ‘Add New‘ button to select the archive we want to access. 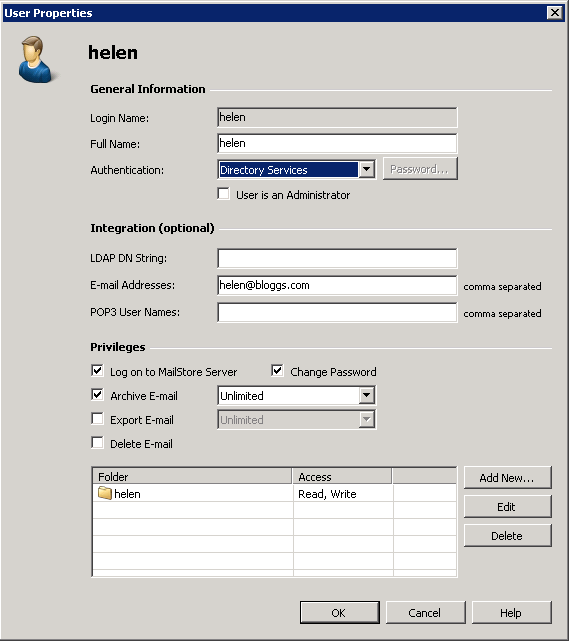 After selecting ‘fred’ from the users list the last stage is to choose the access level we want to give to Helen. Usually MailStore users only require ‘Read’ access so we can leave this as default. Once added you can see that Helen now has access to her own archive and fred’s archive. If we now switch to Outlook and look at what Helen can see from within the MailStore Outlook Add-in, you can see she can choose to browse and search in either her own archive, Fred’s or across both. This view shows you which ‘User Names’ have access to which archives. So now you know how easy it is to give one user the rights to see another user’s MailStore archive, but what if you need to set up rights for a larger number of users to all access a public folders archive? Adding the correct permissions one user at a time would be pretty painful. When in the users management window select the individuals who you want to assign permissions too. Simply select one at a time holding down CTRL, or for a block of users click the first holding SHIFT and then the last to select a larger number at once. ‘Properties‘ button to assign rights that apply to all of the users at once. Finally click OK and all the users will be updated at once. 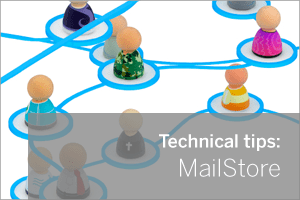 Using this method lets you quickly provide multiple users access to a shared archive and further reduces the need to keep historic data within the email platform which can only be a good thing! Hope you found that useful – feel free to drop me any questions in the comments below. ← BackupAssist MultiSite Manager Beta – Testers wanted!